"Always Delightful" is amazing, private location with large yard for kids, game room, luxury furnishings, & large bedrooms! Perfect for the ultimate... VIEW NOW. Almost all of our cabins have wonderfully warm fireplaces inside. Warm up your toes and fingers after being outside in the cold. You can relax in front of the fire while watching a movie or TV show, or play cards and board games with your family in front of it. The relaxing warmth from the fireplace will make any evening inside feel soothing. Inside all of our cabins, you will find a full kitchen ready for you to use. This gives you the opportunity not only to save money but to not have to worry about going out in the cold! You can spend a morning making a big breakfast and enjoying a Smoky Mountain sunrise. Or you can put your kitchen table to use and spend an evening cooking and having a nice dinner with your family. For a great date night idea in the winter, prepare dinner with your loved one and enjoy it in front of your fireplace, letting it set the mood with a nice warm glow in your cabin. You can find local grocery stores not far from your cabins, like Kroger and Food City, so you can pick up everything you need for your meal. Treat yourself, and let bubbles sooth your troubles. Many of our cabins offer either jacuzzi tubs or hot tubs, some with both. Fill a jacuzzi tub with your favorite essentials oil, light some candles, and grab a good book so you can enjoy some you time in the bath. If you want you can enjoy a winter evening outside in a hot tub where the warm water and steam will keep you feeling toasty even in the cool winter air. Grab your favorite pair of fuzzy socks, some popcorn, turn on the TV, and just snuggle up in bed. You can sprawl out and have the entire bed to yourself, or you can cozy up to your loved one. Snuggling up to your sweetheart is a favorite thing to do during the winter. You can stay warm in our plush bedding, and enjoy some bonding time with your significant other. If you’ve got the kids on vacation with you, you can let them cuddle up in your master king bed to have a family movie night. 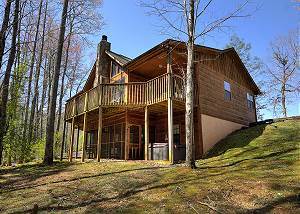 Acorn Cabin Rentals has some of the most relaxing cabins in Pigeon Forge. We’re here to keep you warm and cozy this winter!